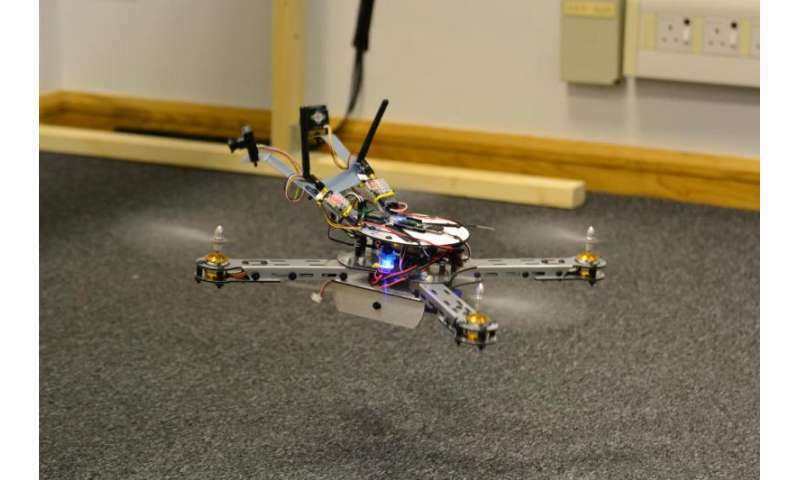 The team of researchers working on the The Green Brain Project has advanced to the point of being able to use what they've created in mimicking a honeybee brain, to actually pilot a flying robot drone—at least partially. The aim of the project is to completely reproduce a bee's brain in digital form, allowing at some point, a flying robot to function as the real thing with onlookers none the wiser. Despite its small size, and limited thinking abilities, the brain of the bee is still an incredibly complicated piece of biology. It allows the bee to see its environment, respond to it, fly around in it and to go about its bee activities, such as mating, pollinating and stinging those that interrupt its mission. The people running the Green Brain Project chose the bee because of its remarkable ability to do so much with so little. Thus far, the BBC reports, the team has managed to put together a rudimentary olfactory (sensory) and vision system and has begun to test what they've created with robots—all of which is based on such science as decision theory and neuroscience modeling and technology such as parallel computing and of course, robotics. Did They provide a Hungry Bee Food at the End of the Tunnel OR Not? Did They provide a Female Bee at the end of the tunnel for a Male Bee in need of 1 OR Not? Did They Heat up the part of the Tunnel they started at to force their departure OR Not? MORE OF SIMILAR NATURE...I Mean! And, in other news, the military hires a bunch of bee brains. If they haven't done such things, they might have had only random data without any idea of the purpose of its flight through that tunnel, including halts if any; Otherwise, with such additions to the experiment, we can match the purpose to data in the future studies! The article was to illuminate the progress in AUV's, not trying to replace bees. Apart from fertilizing the Queen Bee, all the drone does is to hang around until it is killed by the other bees who have a more serious job to do...and we want to put this kind of mentality into a robot!